Water and Sewer Usage Rates are double for those living outside the municipality. All customers (residential, industrial, and commercial) pay the same water rate. New rates became effective on July 1st 2017. 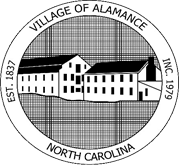 The Village of Alamance’s Official Utility Payment Location is conveniently located at the Town Hall, 2874 Rober Shepherd Drive, Burlington, NC 27215. A payment made at this official location will be applied promptly to your utility account next business day. Other forms of payment may take several days to be applied.